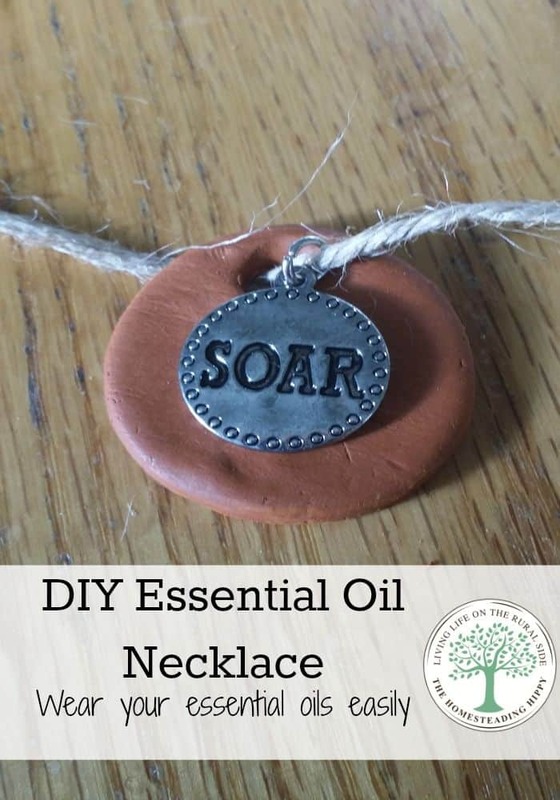 Easy DIY Essential Oil Necklace-wear your oils daily! Essential oils are everywhere these days. You can hardly turn in any health food store without seeing them on a shelf. The hardest part is knowing how to use them safely. Sure, you are going to get a lot of information on the internet and from reps that sell the oils, but is it TRUTH? My biggest concern with some of the information is that you should put the oils directly on your skin for good benefits. I have some issues with that blanket statement. First, anything you put on your skin gets absorbed in as little as 26 seconds and next, conventional wisdom will tell you that you shouldn’t put ANY oil on your skin “neat”, as in with no dilution or carrier oil. Since I like to error on the side of over-caution, I needed a different way to have the oils and their aromatic benefits without worry of over doing it topically. 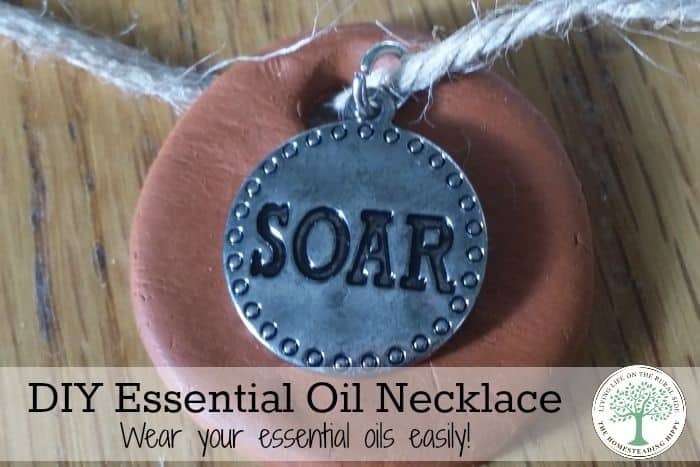 Not everyone responds to the same oils in the same way, so I needed to make a necklace. 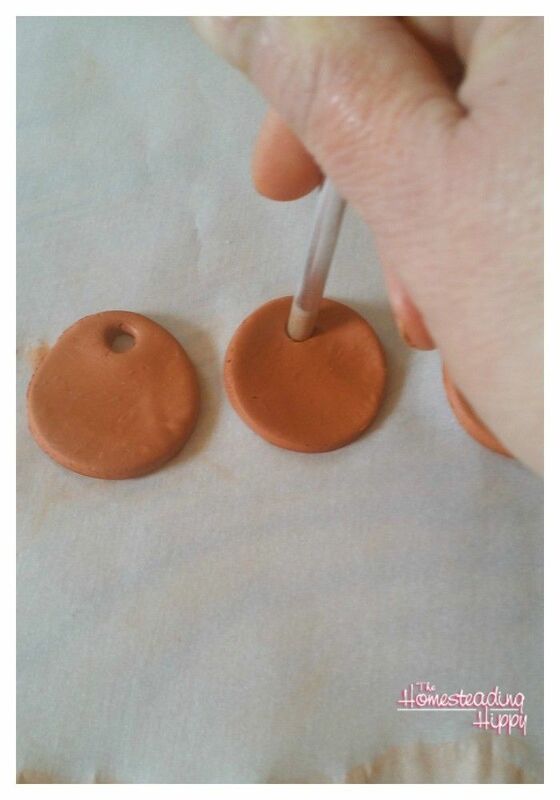 First, get yourself some terra cotta clay. You can find it online pretty cheap here. This stuff is amazing in that it’s air dry, so you don’t have to worry about baking it! Take about 1/2 fistful of the clay out and place it on some parchment or waxed paper. Roll it out until it’s about 1/2″ thick. Carefully, using any size or shape object you’d like, cut out some shapes. I used an old cough syrup measuring cap since I re-purposed the bottle and didn’t want to just toss the cap out. 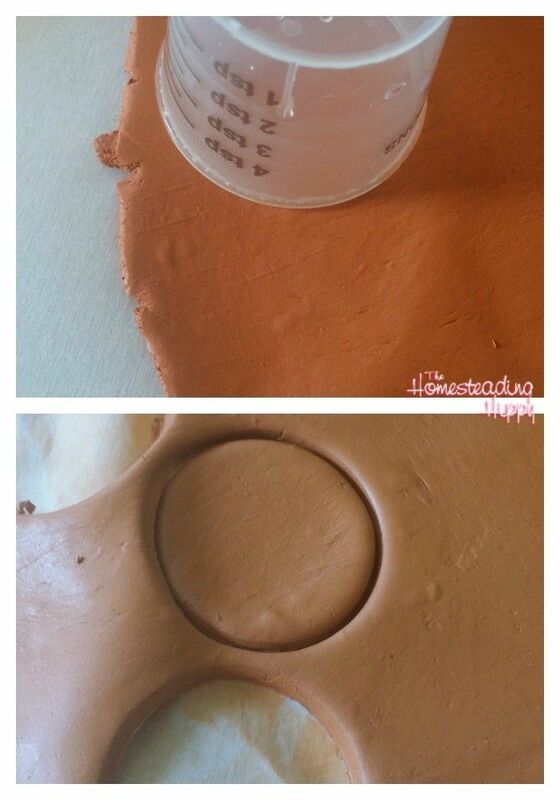 Remove the clay around the shape without disturbing the clay if possible. It’s pretty pliable, so you will have to work slowly with that in order to avoid misshaping the clay. Of course, you could always go for the “rustic” look and make it as misshapen as you’d like. Using a small object, create a hole in the shape. I used the end of one of my tools in this kit. It was pretty easy to push through and get the hole in place. 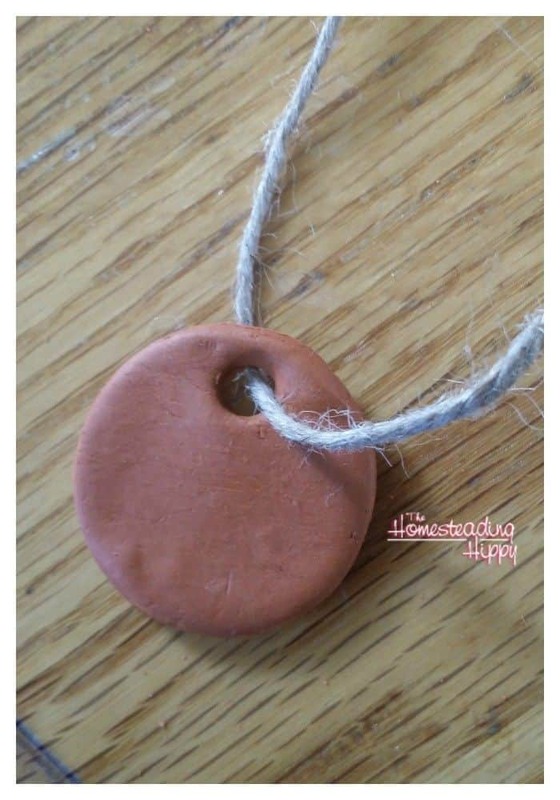 You’ll want to make sure to not get it too close to the edge of the necklace shape, or you risk the clay breaking easily. Allow to dry overnight. The next day, carefully clean any rough edges with a clay tool or light sandpaper. String some cord into the hole. I am liking the “natural” look of jute twine right now, but you could use any chain, rope, or necklace you already have for this. Tie a necklace clasp at one end, and place a drop of craft glue to keep the knot from coming undone. Personalize it! Add in charms you like as well to make this uniquely your necklace. 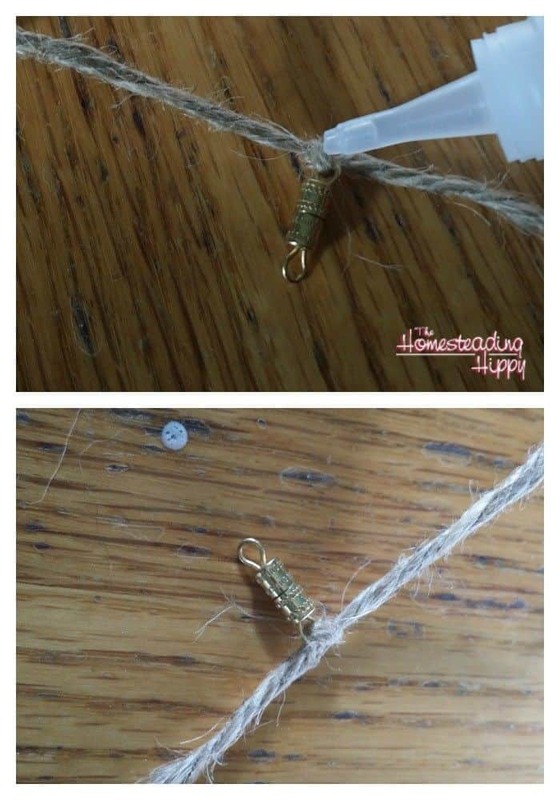 Once you are finished, tie the other end of the clasp to the other end of the twine and place a drop of glue. 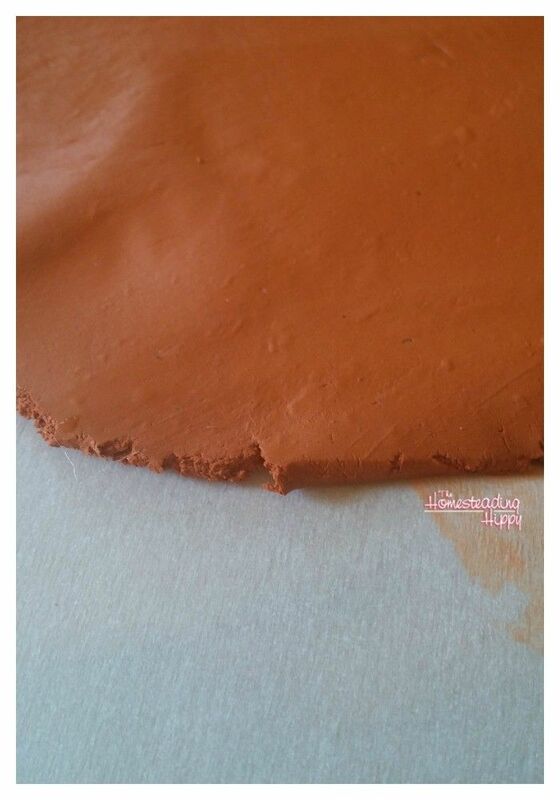 To use, simply add 2-3 drops of your favorite essential oils directly to the terracotta clay. Then, you can lift and “sniff” as needed, or allow the aromas to drift naturally to your nose. My favorites to add to this are peppermint and orange when I need a boost of energy, lavender when I need to relax, or patchouli when I am wanting a “natural perfume” scent. One word of caution: these can be smelled by others, so be careful with what oils you choose around small children. Not all oils are safe for use for children, even in aromatherapy. You want to keep your necklace dry. Don’t get it wet, and just refreshen the oils as needed. I have only had to add 2-3 drops of oil on this for an entire day of use.